Did you know Illinois is the nation’s second leading exporter of soybeans? That fact becomes obvious if you visit at this time of year, when fields are lush with growing corn and bean plants. Soy, a legume, has been grown for thousands of years in Asia; here, it’s used for animal feed, as well as products like vegetable oil, tofu, soy milk, soaps, cosmetics, and biodiesel. It’s very high in protein, too. Now I’m not a farmer, but many of my ancestors were, so I’ve grown accustomed to looking over field crops. And the differences can be startling. You can’t really tell from this angle, but trust me, these plants are healthy-looking and evenly-spaced. I imagine they’ll produce a fine crop. What a nasty mess! 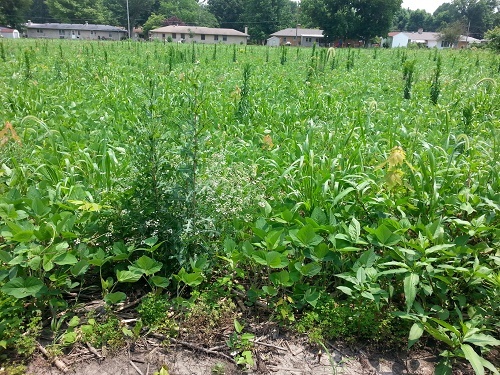 Just look at the weeds, sticking their heads up like an army — and you can’t imagine how many shorter weeds there are growing in and among the poor beans! When my neighbor said there were soybeans growing in this field, I laughed. No self-respecting farmer would prepare a field like this, then sow seeds, leaving the tender plants to battle the weeds for nutrients. Somebody did, and now I’m going to have to look on this mess for probably four more months! Or maybe, like in the Gospel account (Matt. 13:24-30), this farmer planned to grow weeds and crops together for a reason?? 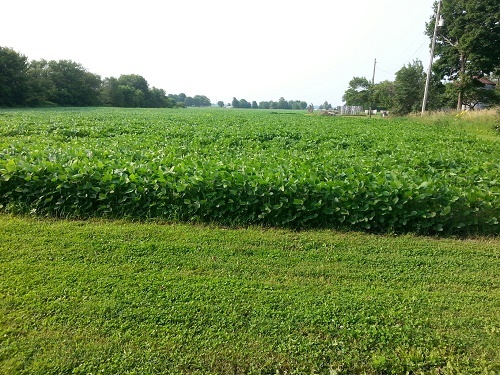 This entry was posted in Seasonal and tagged farming, pretty vs. ugly fields, soybeans, uses for soy, weeds. Bookmark the permalink. He will probably cultivate the field once the rain goes away for a while. I wish my neighbours were like that, oh my…! Hi Lily, and Welcome! I know exactly what you mean, haha! Debbie, I had no idea that Illinois was the nation’s second leading exporter of soybeans. I’m a big soybean eater myself because it’s very high in protein. Wow, that first field is gorgeous! Meticulously kept. And you’re right, that second field is not very appealing with the weeds growing amongst the beans. I don’t know much about planting but it would seem that the weeds would interrupt the growth of the beans. Hope you had a super 4th of July weekend! It rained here all day, so there wasn’t the usual celebratory festivities that normally occur in Philadelphia down around Independence Hall. Good for you, Ron — soybeans *are* big on protein. I learned some things myself in researching for this post. Love when that happens! You know, I fret over stuff like that, the weeds sucking up nutrients that should be going to the plants. I mean, even if all this field is designed to do is serve as animal feed, who wants weeds mixed in with their food?? Sorry it rained on your Fourth. It was beautiful here — finally! — and the fireworks went on as scheduled. I noticed there were some special shows on TV, too, so I guess those whose festivities were cancelled at least had music and fireworks to enjoy vicariously. You reep what you soy?Ok. Clearly this farmer is not a Virgo. Interesting that Il exports so many soybeans. But now I do! Thanks. Happy July 5th-one of my most favorite days! Katybeth, you know me too well — my Virgo is showing, huh? Yes, I suppose it does. Often, too! You don’t know how many times I look at that messy bean field and come *this close* to stepping in it and yanking up those wicked weeds myself, ha! July 5 — ah, the peace and quiet are back. Poor Dallas hates Scary Boom-Boom Day!! Not a farmer so I don’t know if he intended to do it or not. Soy beans are a pretty crop, however I don’t eat soy. I’m not particularly fond of soy either. But I do like seeing fields of soybeans. For one thing, it’s easier to see around corners when beans are planted than when corn is! Hope you had a lovely Fourth, Suzi! They’re pretty after they’ve been sprayed and turn into a field of gold, too. Had a great Fourth, hope yours was as well! Other than poor Dallas freaking out every time the Scary Boom-Booms exploded, yeah, it was fine. At least we were clear — finally!! Sadly, that second field looks a bit like my ‘garden’ this year… ;) Love the quote, though – wrestling those weeds out can be great exercise! We always start our gardens with great anticipation, don’t we, FF? We weed and water and fertilize, knowing that what we’re doing is for the good of the plants. Why, then, do we seem to lose heart when the weeds take over and the good crops or flowers begin to fail? I have no answers — I do it, too!! I love roasted and salted soy beans. They’re a great snack. We had a health food store close by that had some of the best ever, but the store closed. They were just a little ahead of their time. Today, they would do very well. Here’s my thought: that field never was meant to be cultivated. It’s full of volunteer soybeans. They can be a problem in corn fields, and often move into other fields as well. If you really are curious, do a search for “controlling volunteer soybeans” and you’re get articles like this. I was thinking about you this past weekend. The millet has headed, and the corn’s tassled out – before long, it will be harvest time! We need a little hot and dry now, but things are looking pretty good. I had no idea there was a thing called “volunteer soybean,” Linda — amazing, what I learn from my online friends! Whatever it’s called, it’s a mess, and I think if I were the farmer, I’d plow the whole kit and caboodle up and start anew next year — really, he can’t expect any decent payment from such planting! Your corn has already tassled?? Wow! Just goes to show how far apart our states are. Ours, of course, is waaay taller than knee-high, but I haven’t seen any tasseling yet. Probably another couple of weeks, providing we get some decent sunshine. You, on the other hand, will soon be enjoying hot, buttered corn!! Really??? Our field corn, at least in some places, is tasseling, but I know of nobody selling fresh sweet corn yet. This rainy weather isn’t helping any, either! Just focus on the beautiful crops, Debbie. Before you know it, summer will be over and even the weedy soy beans will be gone–and hopefully forgotten! I wish I could, Monica, but all I see in that second field are those wicked weeds! It’s so unusual, too, because this field typically is better cared for. I wonder if the farmer was unable to prepare the field properly and, when it came time to plant, let somebody else tackle the job. That might explain it. I knew Illinois had some of the world’s richest soil, but I never knew that soybeans were such a big crop. One of things I miss most is the wide open spaces where you can see miles and miles of green and golden fields. I know! I’d miss seeing that, too, Pat, if I were some place else. Something pretty amazing to know how much the country (shucks, the world, I guess!) depends on us for food and feed. I love flying over the fields when they look like patchwork quilts, too! Have you had hail, Debbie? Maybe that is the cause for his neglect. Anyway…I’m sure there is a reason. No hail, Audrey. I suspect he missed the narrow window of opportunity (weather-wise) for preparing his field and decided it was merely a feed crop anyway so it didn’t need to be pretty. I’ve always believed a job worth doing is worth doing right, but who am I to judge? !